The members of Nahant Village Church have taken a personal interest in helping the people of South Africa fight against HIV/AIDS. The church has raised enough money for a year’s tuition at a hospital's nursing school. 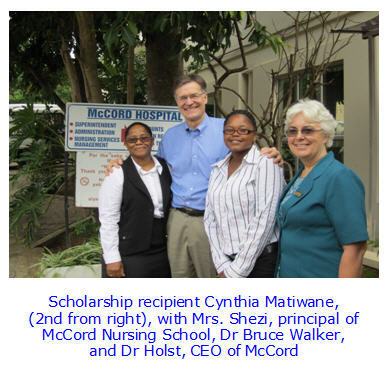 The first scholarship (also called a Bursary) was awarded to a student at the McCord Hospital in Durban, South Africa, so she can complete her education and be certified to help treat HIV/AIDS patients. The first recipient (as selected by the Principal of the Nursing School) was Cynthia Matiwane from Umlazi township and is the first of her family to seek higher education. She’s had a lifelong dream of becoming a nurse, and worked hard to save the money to complete her first year. She did not have the funds to enter her second year of training, so she was again working to raise the money. “I’d like to say that dreams really do come true, and mine has definitely come true today,” said Cynthia upon receiving her scholarship. She will now be able to continue her studies and become a nurse, help support her family, and assist the people of her community. The scholarship was presented on behalf of the Nahant Village Church by one of their members, Dr. Bruce Walker, an internationally known infectious disease specialist who does research in HIV/AIDS in Boston and in Durban, and who brought the scholarship idea to the attention of the church’s members. Walker keeps the members updated on the student’s progress after his visits there. The need for scholarships is great. It costs $2700 for the tuition for one student for one year. “What seems like a very low-cost tuition to us here can be a life-changing amount to someone in South Africa,” said Nancy Cantelmo, former chair of the Mission program at the church. The Nahant Village Church funds this scholarship through direct contributions and through their Soup Sundays, held after worship service during Lent. Soup Sundays have been promoted in local papers and the community is invited to participate as well, sharing hot soup, bread and fellowship, as well as contributing to a worthy cause. Both members and non-members have been very supportive.